Since Strikeforce Challengers will make the UFC’s backyard of Las Vegas, Nevada their home following their June 24th show, it was only fitting the Octagon invade their little brother’s stomping grounds. Zuffa, LLC CEO Lorenzo Fertitta told the LATimes heavyweight champ Cain Velasquez will likely break in his title against Junior dos Santos on November 19th inside the HP Pavilion in San Jose, California. Strikeforce is based out of San Jose and has hosted countless cards at the venue. 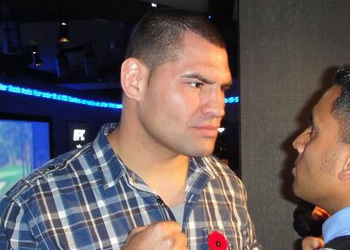 Velasquez has been out of action since mauling Brock Lesnar last October to capture the crown. The champion owns a perfect 9-0 record, finishing off all but one of his victims before the final horns have sounded. After humbling the former WWE superstar, Velasquez underwent surgery to repair a torn right rotator cuff sustained during the contest. He has been riding the pine since January’s operation. Dos Santos solidified his top contender status with a resounding victory over former interim champ Shane Carwin last weekend at UFC 131. The Brazilian bumped his record to a dominant 13-1 mark following the lopsided win. The Gambling Gods have pegged Velasquez an early -150 favorite to retain his belt. The yet-to-be announced card will likely be dubbed UFC 138.